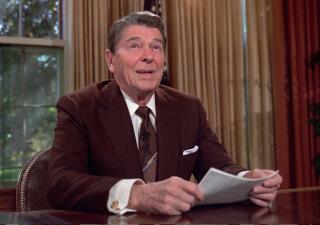 (Newser) – A San Diego newspaper is endorsing a pretty unlikely presidential candidate: Ronald Reagan. Not in the hopes that the former president, who already served his two terms and died in 2004, might actually be elected, but to send the GOP a message. "Certainly, the Republican Party has an argument for the presidency," declares a San Diego Union-Tribune editorial. "Today, the principles of the party of Ronald Reagan are as relevant as ever: a stable border, a strong military, and economic policy focused on low taxes, less bureaucracy, and limited regulation." But Trump isn't fit to lead the country, the editors write. Thanks SD Tribune. You won't get my subscription anytime soon. Didn't know it was a conservative GOP leaning newspaper. I tend to like the ones that see the best candidate out there, regardless of party affiliation. Schwarzeneggar all the way my children... The personal lube tax credit for house maids alone would likely win the nod infidels, think about it. Man - Reagan would be the best right about now. Sad we are stuck with low-lifes on both sides of the ballot. We have an unknown, a snake, and a socialist. Out of those 3 still have to say the unknown is the only 1 with POTENTIAL to do good. Additionally, odd that leftists are so against practical and important stances - strong border & military, lower taxes for a strong economy, and basic freedom to choose how to run your life. Those are the only real issues the government should focus on!